Today is "Territory Day" in the Northern Territory of Australia, and marks the commencement of self-government in the Territory on 1st July 1978. This photograph is of the western wall of the Glen Helen Gorge, part of the West MacDonnell Ranges in the Northern Territory. These ranges were formed when the Alice Springs Orogeny pushed a 12km thick slab of rock vertical, running roughly east-west for 644km. English : Today is "Territory Day" in the Northern Territory of Australia, and marks the commencement of self-government in the Territory on 1st July 1978. This photograph is of the western wall of the Glen Helen Gorge, part of the West MacDonnell Ranges in the Northern Territory. These ranges were formed when the Alice Springs Orogeny pushed a 12km thick slab of rock vertical, running roughly east-west for 644km. 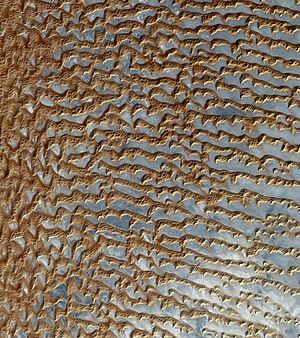 Image of sand dunes in Rub' al Khali, Arabia's "empty quarter". Acquired by the Advanced Spaceborne Thermal Emission and Reflection Radiometer, or ASTER, aboard NASA's Terra Earth-orbiting satellite. English : Image of sand dunes in Rub' al Khali, Arabia's "empty quarter". Acquired by the Advanced Spaceborne Thermal Emission and Reflection Radiometer, or ASTER, aboard NASA's Terra Earth-orbiting satellite. Dead insect covered with fungus and water drops. Fort de Roppe, Territoire de Belfort, France. English : Dead insect covered with fungus and water drops. Fort de Roppe, Territoire de Belfort, France. Emanuel Leutze's depiction of Washington's attack on Hessian forces at Trenton on the morning of December 26, 1776, was a great success in America and in Germany. 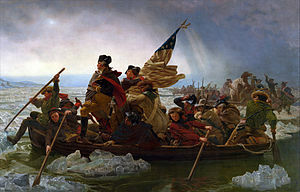 English : Emanuel Leutze's depiction of Washington's attack on Hessian forces at Trenton on the morning of December 26, 1776, was a great success in America and in Germany. English : Inside the Fort de Bourlémont (Mont-lès-Neufchâteau, Lorraine, France). Wide view centred on the Cat’s Paw Nebula (NGC 6334). English : Wide view centred on the Cat’s Paw Nebula (NGC 6334). Nearly pure (99.97%+) iron chips, electrolytically refined, in comparison with a highly pure (99.9999% = 6N) 1cm3 iron cube. English : Nearly pure (99.97%+) iron chips, electrolytically refined, in comparison with a highly pure (99.9999% = 6N) 1cm3 iron cube. South American Sea Lion (Otaria flavescens)pups in a colony in Patagonia. When they are born they are black (or dark brown) and they molt to a mid-brown colour. English : South American Sea Lion (Otaria flavescens)pups in a colony in Patagonia. When they are born they are black (or dark brown) and they molt to a mid-brown colour. An eurasian lynx(Lynx lynx) at Skåne Zoo (Swedish: Skånes djurpark), near Höör, Scania, southern Sweden. English : An eurasian lynx(Lynx lynx) at Skåne Zoo (Swedish: Skånes djurpark), near Höör, Scania, southern Sweden. "The Great Presidential Puzzle": "Illustration shows Senator Roscoe Conkling, leader of the Stalwarts group of the Republican Party, playing a puzzle game. All blocks in the puzzle are the heads of the potential Republican presidential candidates, among them Grant, Sherman, Tilden, and Blaine. Parodies the famous 14-15 puzzle. 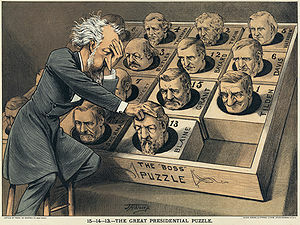 English : "The Great Presidential Puzzle": "Illustration shows Senator Roscoe Conkling, leader of the Stalwarts group of the Republican Party, playing a puzzle game. All blocks in the puzzle are the heads of the potential Republican presidential candidates, among them Grant, Sherman, Tilden, and Blaine. Parodies the famous 14-15 puzzle. The center of the flower of an orange Iceland Poppy (Papaver nudicaule en 'Champagne Bubbles'). Photo taken in the Teacup Garden at the Chanticleer Garden where this cultivar was selected. English : The center of the flower of an orange Iceland Poppy (Papaver nudicaule en 'Champagne Bubbles'). Photo taken in the Teacup Garden at the Chanticleer Garden where this cultivar was selected. The Lichtenstein Castle, near Lichtenstein, in Baden-Württemberg, Germany. English : The Lichtenstein Castle, near Lichtenstein, in Baden-Württemberg, Germany. Pure (99.999%) chromium crystals, produced by chemical transport reaction through decomposition of chromium iodides, as well as comparison a high pure (99,95% = 3N5) 1cm³ chromium cube. English : Pure (99.999%) chromium crystals, produced by chemical transport reaction through decomposition of chromium iodides, as well as comparison a high pure (99,95% = 3N5) 1cm³ chromium cube. Orange Tip (Anthocharis cardamines) on some flowers. English : Orange Tip (Anthocharis cardamines) on some flowers. Entrance to a chine with hoodoos in the Cedar Breaks National Monument. English : Entrance to a chine with hoodoos in the Cedar Breaks National Monument. Oxbow Bend outlook in the Grand Teton National Park. View over the Snake River to the Mount Moran with the Skillet Glacier (12605 ft), Bivouac Peak (10825 ft) and Eagles Rest Peak (11258 ft) in the Teton Range, Wyoming, United States. English : Oxbow Bend outlook in the Grand Teton National Park. View over the Snake River to the Mount Moran with the Skillet Glacier (12605 ft), Bivouac Peak (10825 ft) and Eagles Rest Peak (11258 ft) in the Teton Range, Wyoming, United States. An underwater view of a woman, wearing a long gown, floating in water. Photograph by World War II and fashion photographer Toni Frissell at Weeki Wachee Springs, Florida, USA, 1947. English : An underwater view of a woman, wearing a long gown, floating in water. Photograph by World War II and fashion photographer Toni Frissell at Weeki Wachee Springs, Florida, USA, 1947. The BMW S1000RR sport bike produced by BMW Motorrad. It was specifically designed to compete in the 2009 Superbike World Championship. English : The BMW S1000RR sport bike produced by BMW Motorrad. It was specifically designed to compete in the 2009 Superbike World Championship. View from the town Kranjska Gora in north-west Slovenia to the Julian Alps with Razor (left) and Prisojnik (right). English : View from the town Kranjska Gora in north-west Slovenia to the Julian Alps with Razor (left) and Prisojnik (right). The "Baker" explosion, part of Operation Crossroads, a nuclear weapon test by the United States military at Bikini Atoll, Micronesia, on july 25th 1946. 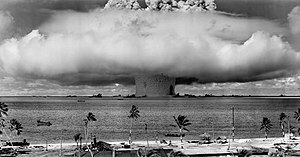 English : The "Baker" explosion, part of Operation Crossroads, a nuclear weapon test by the United States military at Bikini Atoll, Micronesia, on july 25th 1946. Panorama of Paris, featuring the Pont des Arts (bridge of arts) and just behind, the pont Neuf (new bridge) and the île de la Cité. The Institut de France stands on the right, at the end of the Pont des Arts. The towers of Notre-Dame cathedral can also be seen on the far behind. English : Panorama of Paris, featuring the Pont des Arts (bridge of arts) and just behind, the pont Neuf (new bridge) and the île de la Cité. The Institut de France stands on the right, at the end of the Pont des Arts. The towers of Notre-Dame cathedral can also be seen on the far behind. Portrait of an emu (Dromaius novaehollandiae). English : Portrait of an emu (Dromaius novaehollandiae). Machicolation tower of the Fortress Marienberg in Würzburg, Germany. The tower was built by Balthasar Neumann from 1724 to 1729. English : Machicolation tower of the Fortress Marienberg in Würzburg, Germany. The tower was built by Balthasar Neumann from 1724 to 1729. In this view captured by NASA's Cassini spacecraft on its closest-ever flyby of Saturn's moon Mimas, large Herschel Crater dominates Mimas, making the moon look like the Death Star in the movie "Star Wars." 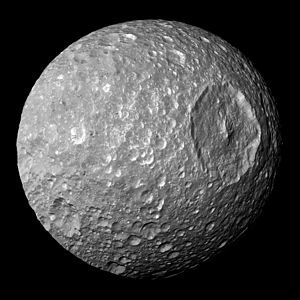 English : In this view captured by NASA's Cassini spacecraft on its closest-ever flyby of Saturn's moon Mimas, large Herschel Crater dominates Mimas, making the moon look like the Death Star in the movie "Star Wars." Hazy blue hour in Grand Canyon. View from the South Rim. English : Hazy blue hour in Grand Canyon. View from the South Rim.